Yesterday, I mentioned a few technology blogs that I feel all educators need to follow. Today, I am going to mention a few of the bloggers who inspire me because of their ability to continually write posts that motivate me and push my thinking. I recommend a daily dose of each of the following blogs! Weblogg-ed - If you have been looking at web 2.0 tools, you definitely know the name Will Richardson. Will's blog posts are always thought-provoking! Because of this he gets more comments per post than any other blogger that I know of. Will's keynote at the Blue Ribbon Institute in Reading, MA in 2009 pushed me to take the full plunge into the world of social networking. His book Blogs, Wikis, Podcasts, and Other Powerful Tools for the Classroom is a must read. In addition, I have seen his work with teachers in the Powerful Learning Practice Network and I wish all educators could have the opportunity to spend a few days with Will. Teacher Reboot Camp - This is Shelly Terrell's blog. Shelly is one of the most collaborative members of my PLN and it comes as no surprise that she is one of the founders of Tuesday's #edchat on Twitter. She routinely provides her followers with resources that help them grow as both educators and human beings. If you haven't read her free e-book The 30 Goals Challenge, I encourage you to do so. 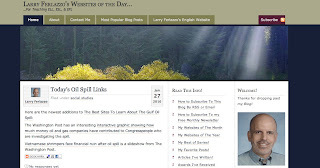 Larry Ferlazzo's Websites of The Day... - Larry is an ELL teacher in Sacramento, CA who shares insightful posts daily that help teachers, students, and parents. Last year he was the first runner-up for the Best Resource Sharing Blog by the Edublog Awards and he was the second runner-up for a Lifetime Achievement Award. His Best of Series is one of my favorites! Dangerously Irrelevant - Scott McLeod gets right to the point, starting with the title for his blog. This man's impressive resume includes a TED talk. He is also one of the creators of the amazing Did You Know? (Shift Happens) Videos. If you haven't seen them you really need to check out all four (Version 1, Version 2, Version 3, Version 4). I am hopeful that BHS will have the opportunity to work closely with the Dr. McLeod's Center for the Advanced Study of Technology Leadership in Education CASTLE in its upcoming transition to 1:1. As I continue to highlight a few of my favorite blogs over the next few days, I know that I will leave out a number of great bloggers. So please continue to comment and let me know about some of the blogs you find inspiring so that I can check them out. These individual bloggers have very impressive blogs. I commend them for putting in an exorbitant amount of quality time, effort and care into their profession. They are phenomenal advocates to their students and communities. I enjoyed viewing these blogs. So I need to follow all these sites to remain motivated for blogs. I love these informational things. It's a very nice post I have come across.I really like this post very much.It's a very appreciated post.Thanks for sharing.Keep blogging.